We turn up for this coffee-to-cocktails gamechanger. Fine hair has its upsides, but what it gains in manageability, it lacks in hold and volume. This hair type is notorious for falling limp midday, not to mention greasing up quicker than its thicker counterparts. And although it may seem like a hassle to work around, there is actually quite an easy fix that of all hair care products out there, is considered the best: dry shampoo for fine hair. What’s the Best Dry Shampoo for Fine Hair? Before we even get into superlatives, let’s first get into the nitty gritty of what goes into a dry shampoo. Typically formulated with starch and most popularly marketed in a pump spray can, dry shampoos were invented as a no-rinse solution for cleaning hair. The application involves being sprayed onto the root area and then dissipated onto the rest of the strand. It was an effective solution for soaking up excess oil and grease without wetting hair. This convenience is what makes this hair care product a hit. Thanks to dry shampoo, women (and men) now had an easy, on-the-go solution for refreshing their locks during a workday. Some even alluded to the extra texture and fashionable “grit” that they got from dry shampoo. This grit is also appealing to runway stylists, grungy beach-wave fans and late-crunchers alike. Manufacturers expanded on the benefit of dry shampoo usage by adding onto their existing formulations to better capture and address the needs of more hair types. One such example is making the best dry shampoo for fine hair. These dry shampoos feature more volumizing, style-plumping advantages for thin hair that needs more body. This makes the whole day-to-night process that much more seamless—and changing the lives of 9-to-5-to-9ers everywhere. Love Beauty and Planet Rosehip & Patchouli Extend Dry Shampoo aims to give back that freshly washed body and bounce to hair. The formula does this by conveniently absorbing oil and cleaning, refreshing and volumizing locks. With use, you can effectively say goodbye to that 4 p.m. beauty slump and still head out to happy hour or networking socials looking fresh as a button. Refresh a simple daytime look for night with the help of some dry shampoo. For Bed Head by TIGI’s Oh Bee Hive! Dry Shampoo, the trick is having a fine powder to better absorb oils and pave the way for long-lasting updos. It helps rid hair and scalp of residue, to better live up to the fabulously iconic look it’s named after. 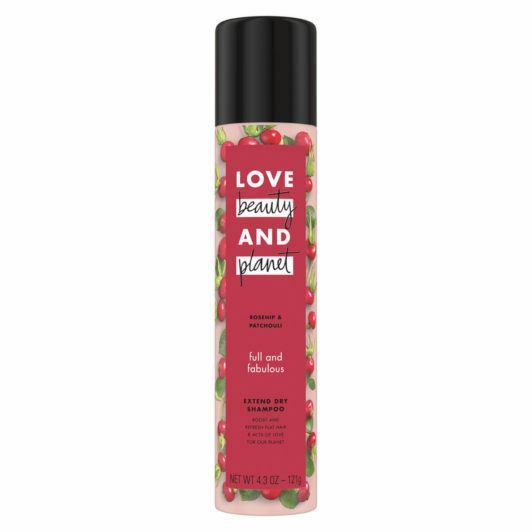 For Love Beauty and Planet Radical Refresher Citrus Peel Uplifting Dry Shampoo, it’s a focus on revitalization by removing oil, odor and impurities to help impart a weightless, bouncy feeling. Mineral clay and citrus help revive fine, limp strands by providing them with some much-needed movement. Colored hair also gets a reprieve from dry shampoo: It helps clean hair without wetting it, which makes color leech out quicker. The best dry shampoo for fine hair is one that specifically addresses your needs. The goal is to achieve a freshly washed bounce, a revitalized feeling or a refreshed hold and control. You want this all in a convenient, easy-to-administer formula that doesn’t leave any telltale residue (because nobody wants white flakes!). Dry shampoo is quickly becoming a staple in today’s modern hair and beauty regimens. Until we find a better solution to getting shower-fresh hair while in the back of a cab, we’re sticking to this one. Best hairsprays for fine hair.